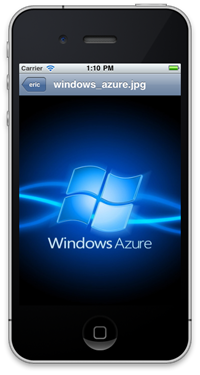 Today we’re going to wrap up our first iOS client that connects to Windows Azure Websites. If you’ve been following along, then as of now we have an app that will display a list of shortened URL slugs and will allow the user to tap in to see more details on them. 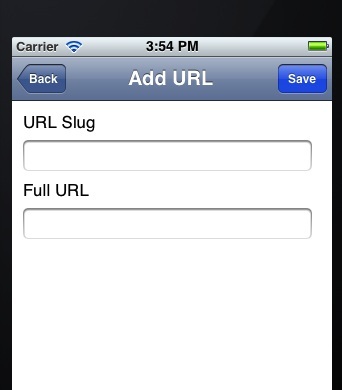 Today, we’re going to complete our app by giving the user the ability to add new shortened URLs from the app. You can download the code we left off with in part 4 here. To start, let’s go to our storyboard and go to the view controller with our table view in it. This is where we’re going to want to add a button to create a new shortened URL. Drag a Bar Button Item from the control selector to the top right of the navigation bar in the view. When that’s done, in the Attributes Inspector, change the Identifier drop down to Add. UIAlertView *alert = [[UIAlertView alloc] initWithTitle:@"Failed to Create Shortened URL"
used. Please use a different slug." Here, we check to see that the URL doesn’t already exist locally (note that if some other client inserted it on the server side after we had pulled down our data, we wouldn’t know). If it does exist, we show a UIAlertView. If it doesn’t, we pass the data back to the delegate for our UrlDetailsViewController. As you’ll recall (or if you look above) we set the delegate on our UrlDetailsViewController in the prepareForSegue method. First, go back to your ViewController.h and make the class implement UrlDetailsViewControllerDelegate as well as NSUrlConnectionDelegate. // We should inform the user that the connection failed. This is somewhat complicated so let’s step through it. First, we create our NSMutableUrlRequest and set the HTTP method and content type on it. Then we put our URL values into a dictionary which we serialize into JSON using NSJSONSerialiazation. That data is set to be the body of the request. Then, we initiate a NSUrlConnection with the request object and set it’s delegate to self. Lastly, we add the URL object to our AppDelegate’s collection, popping the UrlDetailsViewController off the stack, and reloading the data in the table view. We’re kind of assuming things will work here because we’re adding the URL object before we know it was successfully saved to the database. So that is something to consider. All that’s left, is to implement the NSUrlConnectionDelegate methods. message:@"This URL Slug has already been used. Please use a different slug." message:@"There was an error creating this shortened URL. Please try again." If you’ve used NSUrlConnection before, these methods should all look fairly familiar. The only thing worth stepping through a little bit is the connectionDidFinishLoading method. In that method, we’re deserializing the JSON that comes from the server and then checking the status. If it was a success, we don’t do anything. If there was a failure, the URL already existed, or we get back any other response, we show an UIAlertView with a warning message. That’s all there is to it and now our client is able to add new shortened URLs. There’s ample room for improvement on some of the features here. For example, we’re not checking the validity of a full URL on the client side, but we are on the server side. It wouldn’t take much to implement the same check and present feedback to the user in a friendly way. If you’ve stuck through it this far, we’ve completed a simple iOS client connecting to a Windows Azure Website written in PHP. Outside of a little PHP understanding, none of this required ever moving away from OSX, XCode, or a simple text editor. You can download the full source to this demo here.